Massaguacu in São Paulo is a sheltered beach break that only works when conditions are just right. Winter is the favoured time of year for surfing here. Works best in offshore winds from the northwest with some shelter here from south winds. Clean groundswells prevail and the ideal swell angle is from the east southeast. The beach break provides left and right handers. When it's working here, it can get crowded. Watch out for Rips / undertow - Localism. For Caraguatatuba, 9 km from Massaguacu. At Sao Luis DO Paraitinga, 41 km from Massaguacu. The two graphs above are also combined in the single Massaguacu surf consistency graph. 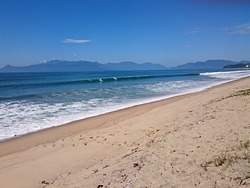 Also see Massaguacu surf quality by season and Massaguacu surf quality by month. 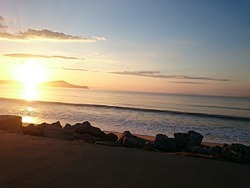 Compare Massaguacu with another surf break. The closest passenger airport to Massaguacu is Sao Jose Dos Campos Airport (SJK) in Brazil, 67 km (42 miles) away (directly). The second nearest airport to Massaguacu is Santos Air Base Airport (SSZ), also in Brazil, 104 km (65 miles) away. Third is Guarulhos (Sao Paulo) Airport (GRU) in Brazil, 117 km (73 miles) away. Congonhas (Sao Paulo) Airport (CGH) in Brazil is 135 km (84 miles) away. Santa Cruz (Rio De Janeiro) Airport (STU), also in Brazil is the fifth nearest airport to Massaguacu and is 181 km (112 miles) away. 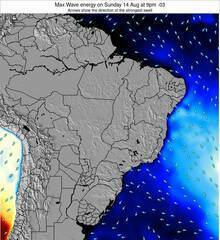 Questa è la pagina Surf-Previsione per Massaguacu, São Paulo. Utilizzare la scheda di navigazione in alto per visualizzare Massaguacutemperatura del mare,Massaguacu fotografie,Massaguacu dettagliate previsioni onde, il vento e le previsioni meteo,Massaguacu webcam, vento corrente daSão Paulo stazioni meteo e Massaguacu previsioni marea. il link Brazil mappe maree apre l'immagine grande, che mostra Brazil e dei mari circostanti. Queste mappe possono essere animate per mostrare le diverse componenti del moto ondoso, energia delle onde, periodo d'onda, altezza delle onde, insieme con le previsioni del vento e meteo, meteo corrente e osservazioni sullo stato del mare dal Brazil onda-boe, le navi passanti e stazioni meteo costiere . 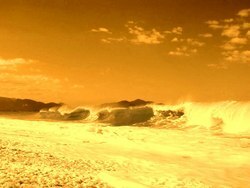 Ciascuna delle pagine di previsioni per questo surf break rappresenta uno strumento di wavefinder globale e regionale per individuare le migliori condizioni di surf nella zona intornoMassaguacu.